Our highly rated experience, The Circle Island Sunrise Photo Tour will guide you through a 10-hour circuit of O’ahu. You will get to photograph and witness ancient natural beauty, cultural hubs, Hawaiian wildlife and the peaceful design of a temple shrine. The time will pass by as you will be having so much fun on this tour! A perfect fit for anyone who really want to see the whole island and get the most out of their vacation in Hawaii. From sunrise on the Eastside of Oahu to the iconic North Shore, our Circle Island Sunrise tour brings you through locations like Makapu’u Beach Lookout, Waimanalo Bay, extinct volcanoes, century-old marketplaces, lush forests and hidden nature spots. Plus, our last stop will be searching for turtles. 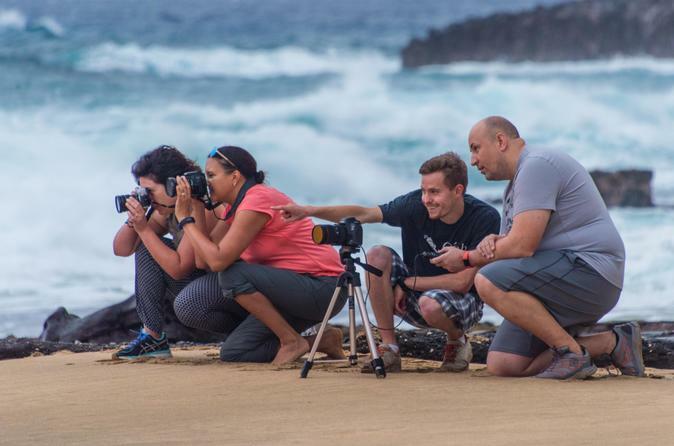 Capture great content, have fun, and become an expert on the rich diversity and beauty that Oahu has to offer! You’ll create memories to cherish as well as personal keepsakes from your trip. We begin the day on the East side of Oahu at the stunning location of Sandy Beach. Arriving in time to catch the sunrise, you’ll have the opportunity to photograph the drama of daylight as it casts away the night. Next, we’ll continue along the scenic Kaiwi shoreline, stopping at Makapu’u Lookout and Makapu’u Beach, where you can play with distance to capture spectacular landscapes. You will be guided to spots of epic natural phenomena, including giant tide pools, the dwelling places of extinct volcanoes, and a hidden blowhole. You’ll even have the chance to capture the famous Makapu’u lighthouse trademark, an essential image of any Oahu photography tour! Moving on to Waimanalo Bay Beach Park, ranked as the number one beach in America. The longest uninterrupted white-sand beach on all of Oahu lined with unique Australian ironwood trees creates a dynamic interplay between the visual elements of earth, sky, and water, and adds a real richness to your Hawaii photos. Next stop is on the Windward coast at the magnificent Ko’olau Mountains. To stand in the presence of these ancient formations creates an energy of pure appreciation. Experience the atmosphere and capture the memory through gorgeous photographs before heading off to the Kalapawai Market for a tasty breakfast. This market has been a part of Hawaiian life since 1932 and offers a wide selection of food and drink that will melt your taste buds! After recharging with a satisfying breakfast, this Hawaii tour will head over to a lookout of Kaneohe Bay to soak in the view of crystal clear waters. This site is one of the must-do activities in Oahu because it’s one of the largest sandbars in the world! Knock that off your Hawaii tour bucket list! Cruising over to the Byodo-In Temple brings the focus onto architectural design and themes of spiritual mindfulness and the esoteric. The Byodo-In Temple is a non-denominational shrine located on the island of Oahu in Hawaii in the Valley of the Temples. Our Circle Island Sunrise tour continues to pass through Waiahole before stopping at Kualoa Beach Park to see the small island officially named Mokoli'i, but more commonly known as Chinaman’s Hat. We’ll then head to the Windward coast to view the country scenery, local and colorful fruit stands, and a stunning 150-year-old Banyan tree as we make our way to the famous North Shore. Depending on the time of year, you’ll witness the world-famous Banzai Pipeline and the daredevil surfers who test the power unleashed through oceanic waves, or you’ll search for the beloved Hawaiian Green Sea Turtle who basks on white sandy beaches. Our final stop is at the Dole Plantation. At the end of this curated photography tour of Oahu, your fun-filled day will leave you with an array of quality photographs. Bring your images home to share with loved ones and carry forward your enjoyment of photography play!